On September 19, Disney will celebrate the 25th Anniversary of their beloved animated classic Beauty and the Beast with a new Blu-ray edition. While the movie itself is pretty exciting, this impending release also contains a detailed look at the new live-action movie starring Emma Watson and Dan Stevens. Some critics have already received an advanced copy of the Blu-ray, and images from this sneak peek have infiltrated the Internet giving us our first look at this fairy tale adventure. Yesterday's big reveal showed us Gogsworth and Lumiere as they will appear in the movie. Today, we have three pieces of concept art. They arrives with an image from what looks to be a rehearsal. Though we got to see a teaser trailer earlier this year, it didn't include any footage from the finished movie. 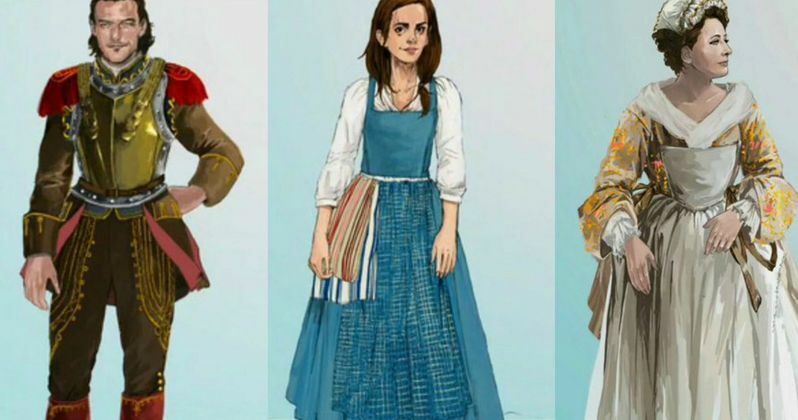 Here, we finally get to see what Emma Watson looks like as Belle. We also get a better look at Luke Evans as Gaston. And we get to see Mrs. Potts, played by Emma Thompson. We're not sure how close these images represent what we'll see in the finished movie. Also arriving with this batch of concept art is what appears to be a scene from rehearsal, which shows us the backside of Emma Thompson as she dances with Luke Evans' Gaston. Yesterday, we got a full-on look at Dan Stevens as Beast before his transformation. We also got to see a crowd scene from inside a pub, which gave us a first look at Josh Gad as LeFou and another peek at Evans' Gaston. Bill Condon is directing this faithful adaptation of the tale. Ian McKellen stars as Cogsworth and Ewan McGregor play the role of Lumiere, though the actors themselves are nowhere to be seen in this special sneak. We're not sure when this full behind-the-scenes preview will make its way online, or if Disney even plans to debut it anywhere except as an exclusive on the new Blu-ray release. Other cast members in the movie include Kevin Kline as Maurice (Belle's father), Gugu Mbatha-Raw as Plumette, the feather duster and Stanley Tucci as a grand piano named Cadenza. Its possible that Disney will finally unveil all of these characters as they appear in the new movie quite soon. Stephen Chbosky wrote this new take on the fairy tale, with Mandeville Films' David Hoberman and Todd Lieberman producing. Eight-time Oscar winner Alan Menken, who actually won two of those awards for this animated version of the movie, returns with three new songs. The movie is hitting theaters on March 17, 2017. While we await the arrival of the 25th Anniversary Blu-ray, you can get a quick sneak peek at some of the characters here thanks to Twitter.